04 Apr 2019 --- A patent-pending probiotic mix may help shield patients who suffer from gastrointestinal (GI) diseases from harmful biofilms – antibiotic-resistant microbial communities. This is according to a study from the Case Western Reserve University and University Hospitals (UH) Cleveland Medical Center. The study tested the ability of a novel probiotic to prevent and treat biofilms containing yeast bacteria. The findings show that the probiotic weakened the bacteria and stunted its growth. 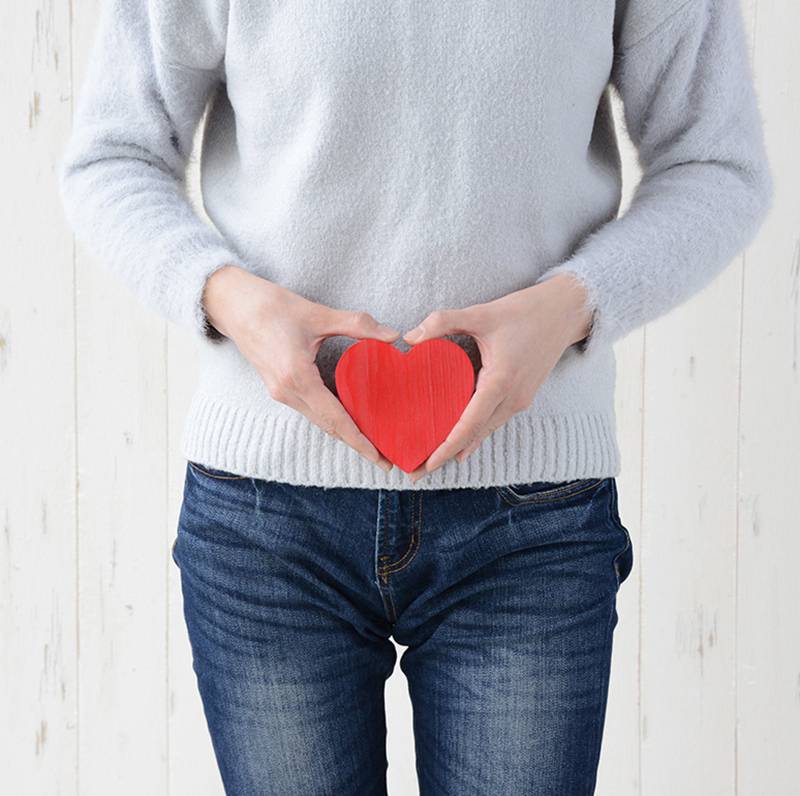 The researchers conclude that the new probiotic may boost the prevention and treatment of GI diseases. Published in The American Society for Microbiology’s journal mBio, the new research examined how the probiotic could influence biofilms containing yeast bacteria, particularly in damaged guts. Biofilms can contain an infectious polymicrobial mix of bacteria and fungi living together underneath a thick protective slime. These antibiotic-resistant biofilms can be broken apart by other microbes living in the gut, as well as probiotics. The researchers conducted a series of experiments and grew yeast (Candida species) and bacteria (Escherichia coli and Serratia marcescens) into biofilms. 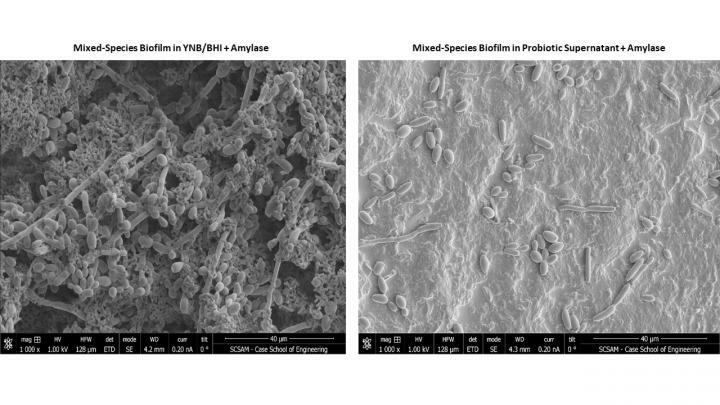 They then exposed the biofilms to a particular probiotic mix identified in a previous study. The probiotic mix is one part yeast, three parts bacteria and a small amount of amylase (an enzyme found in saliva). Microscope images showed biofilms exposed to the mix were looser-knit communities that were overall thinner and weaker than untreated biofilms. The researchers found that the probiotic weakened yeast living in young biofilms. The yeast inside the biofilms was stunted in growth and did not form reproductive structures that help seed new biofilm growth and expansion. Click to EnlargeMixed-Species Biofilm in probiotic supernatant.The results are promising for the development of new treatment methods for people suffering from GI diseases, such as inflammatory bowel disease and Crohn’s disease. Ghannoum has previously conducted research that identified three types of microbes – Candida species, E. coli and S. marcescens – that were significantly elevated in the biofilms of people with Crohn’s disease. According to the researchers, they form an especially thick biofilm that can trigger inflammation in the gut. “Probiotics could represent a new way to manage such painful inflammation,” Ghannoum says. By growing yeast and bacteria in a range of combinations, the researchers further studied the development of biofilms in Crohn’s disease patients. The tests showed that Candida yeast species are more likely to team up with the bacteria in biofilms than other yeast species. Additionally, the researchers observed that both Candida albicans and Candida tropicalis form thick biofilms when grown alongside E. coli and S. marcescens bacteria. Other non-Candida yeast species could only form thin biofilms, not any thicker than a single species grown alone. The results point to Candida species as most likely to form thick biofilms in patient guts that may be susceptible to the probiotic. 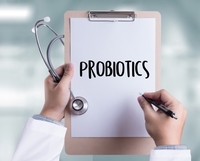 In order to determine which enzymes and metabolites are secreted by the microbes, the probiotic used was strained of whole, beneficial microbes before testing. The researchers are now looking into which secreted factors inside the mixture are responsible for the anti-biofilm effects. Moreover, the researchers have applied for a patent for the probiotic they developed. In the same space, Chr. Hansen has established a 50/50 joint venture together with Lonza in the live biotherapeutic products (LBPs) industry, which marks the next phase in the evolution of how healthy bacteria are perceived. The partnership will focus on new strains with proven clinical data. As nothing in the live biotherapeutic domain is commercial yet, the move holds a lot of potential. Crohn’s disease and irritable bowel are areas prebiotics and probiotics research is set to explore going forward. “Strains are specifically identified with the aim of treating disease. There is not a general library or cell bank that we can take in and use. Companies working in pre-clinical studies are looking to identify new anaerobic strains that have therapeutic and curative effects rather than preventative ones,” Dr. Hassan Benameur, Lonza’s head of Oral Drug Delivery Innovation, tells NutritionInsight. Click to EnlargeHe notes that using probiotics in pharma isn’t a mature idea yet or clearly defined. “We are far from the notion of using probiotics in pharma as it is a system that is not clearly defined, even at a regulatory level. The use of pro and prebiotics in focused on prevention and wellness,” he says. Another future area of focus, Benameur says, is the use of phages to kill bacteria. “Irritable Bowel Syndrome, curing C. difficile infections and Crohn’s disease are the areas where it has been most clearly demonstrated, he notes. In further research on this platform, research recently published in ACS’ Journal of Agricultural and Food Chemistry, found that growing bacterial biofilms on thin sheets of nanofibers could be a great way to produce a fermented milk product that can deliver hardy probiotics to the digestive tract.